Mobile app industry is on a constant lookout for technologies and processes which would make the user experience smooth. 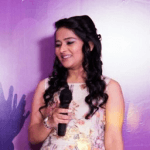 And Google being the prime evangelist in the domain of premium user experience is always coming up with new principles and technologies tilted towards offering memorable and natural experience to the millions of Android users around the globe. It was not ages ago when we covered two such Google offerings in our article titled ‘A Complete Overview of Instant Apps and Progressive Web Apps’ and between then and now, while on one hand, Instant Apps have become a hit in a number of app categories, Google Progressive Web Apps, on the other hand, have emerged as the go-to technology for Startups and Small and Medium Enterprises. Keeping the discussion on Instant Apps for some other day, in this article, we will be looking into the Progressive Web Applications, specifically, the role that they play in drive businesses for the Small and Medium Businesses across the globe a.k.a the benefits of progressive web apps for businesses. 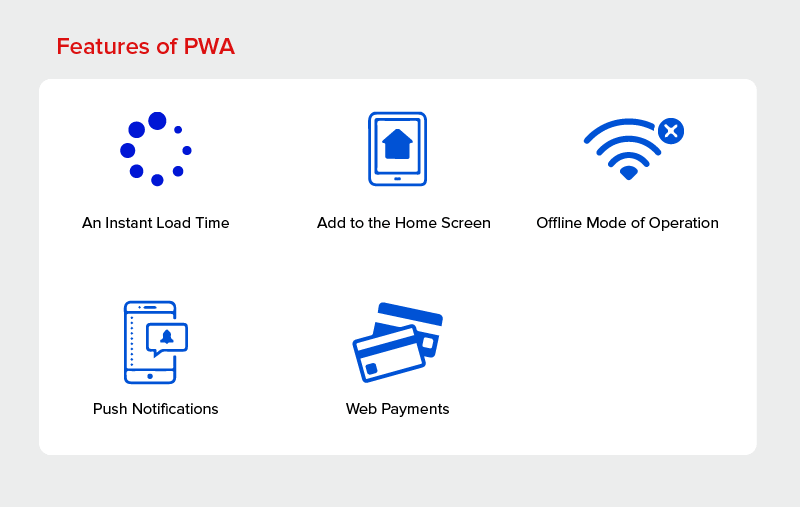 Now while we have already shared what are Progressive Web Apps and what Google wants you to know about PWA it is time to get you acquainted with the several major benefits that the technology can offer with its composition of beneficial functionalities. Built with the progressive enhancements working as the core principle, PWAs enable apps to load in real-time on the repeat visits to a page. The technology takes advantage of the device level cache using which it lowers the amount of information required to respond to the users’ interaction. A number of the modern-day web technologies enables apps to save the data in device’s cache so that it gets delivered straight to users’ device. When a user makes multiple visits from one page, the PWAs offer instant loading through the display of cached content like in case of the Native Apps and then displays the rest of the content progressively. The ‘Add to Home Screen’ prompt that PWA comes armored with allows the users to install the applications straight on their device and once users accept the request, the web apps offer them native-like experience right on their home screen. This ‘Add to Home’ functionality offer the PWAs the same scope of accessibility and visibility that the Native Apps offer something that proves to grow into the business cases for Progressive Web Apps. The best part of PWAs is that the functionality allows the businesses to decide how the web app will appear to the users by helping them define the home screen icon, splash screen, and the theme color of the address bar in the modern browsers. Using these personalizations, businesses can get their icon added on the home screens of millions only to be opened to experience an immersive experience with complete control of the screen orientation. Developed on the principle of offline-first, the PWAs come powered with the robust caching mechanism to manage the offline requests and then send them across when the connection is available again. Because of this, businesses can provide a much greater level of performance irrespective of what the connection condition is. One of the major factors that were standing there between Native and Web apps – Push Notification has now been made available in the PWAs. Through PWAs, your business can use the web push notification for communicating with the website visitors in a more personalized manner. The notifications that look and feel exactly like the native app notifications run on users’ devices and empower businesses to tap their highest value offering web audiences. PWAs come armored with the web standards which simplify and secure the online payment for the users coming on the website/ application. In order to achieve that, web payment functionality makes use of the stored address and payment details instead of asking the users to fill in all the details in a checkout form. And because the standard is developed on a native mode in the browser, the PWAs which use web payments are able to offer a constant checkout experience for all users. Also, it gives businesses the flexibility to offer a variety of different payment options which work on a range of different devices and browsers. See the different business cases for Progressive Web Apps and how technology has proved itself beneficial for a range of different industries? Google Progressive Web Apps are not only about bringing the native features on to the web, but they have also been conceived and implemented to solve real-world issues that businesses face – something we are going to look into now. What Startup Problems do Progressive Web App Development Solves? Standing out from the crowd of over 2 million apps present on the Play Store and App Store is a task that takes efforts for an app to come true. But when you offer them an app like a web page that they intentionally come across when frequently visiting a website or social media page, you get major steps ahead of the Play Store and App Store crowd. According to a Comscore report, the majority of the users download zero apps in a month. PWAs as we note, come with a number of factors that have been designed to get over the attached app fatigue. The App Install prompt is only given when the users have made repeated visits on the webpage. The App installation process is extremely instantaneous as the users don’t have to go through the process of going to the app store, searching the app and then installing it on their devices. The app size is much lower as they work around the abilities of the browser. The different engagement functionalities like offline mode, push notifications, etc work even when the visitor does not install the app. Native apps can be used on platforms which they are developed for. For example, an Android user can only get insight into apps that are there on the Play Store and same with the iPhone users. Thus, restricting the app reach that a business can achieve in totality. Progressive Web Applications, on the other hand, work on the web and have no dependency from the Play Store and App Store making it impossible for your brand to get restricted on an X set of the customer base. Maintaining an app that runs on either the Play Store or App Store or both is not just expensive but also time-consuming – the two issues which are difficult for a startup to handle or even afford. PWAs, on the other hand, are Web Apps, which are a lot easier to handle, all – time, cost, and resource dependency-wise, something that acts as one of the key advantages of PWA for business. 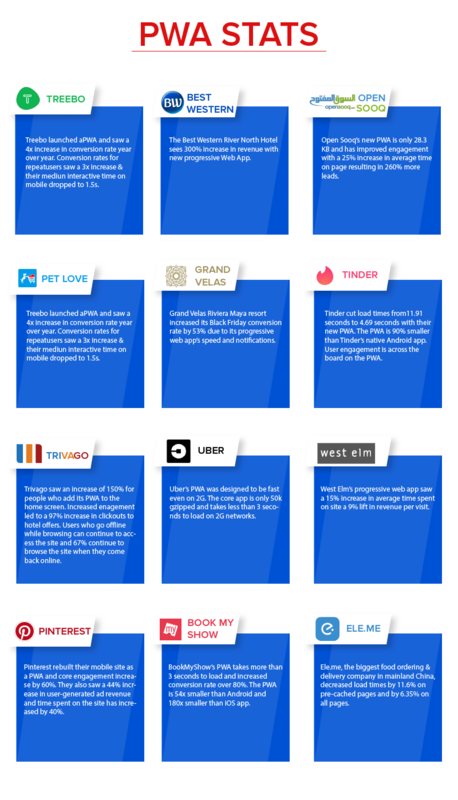 When you are invested in the Play Store or App Store, you have to work according to their rules. Rules that tend to curb not just the complete extent of creativity but also a chunk of revenue by asking businesses to pay them a share of revenues earned on the app-based purchases. App Retention is an occurrence that continues to plague the mobility world across categories. In a scenario like this, the facility of the app taking up a major chunk of the storage space along with the ease of sending across customized push notification is something that plays a contributory role in keeping the users engaged, in return helping with the low abandonment rates. Now that we have looked into the different problems that the PWAs solve, it is time to look into how the technology fits in a Startup or Small and Medium Business Ecosystem and the benefits of progressive web apps for businesses. How Can Small Businesses Use PWAs? The answer to How can PWA help Businesses lies in a number of ways. Being a business owner who is just starting their business can be difficult. The number one objective of why you own the business – to earn money – itself can become difficult to achieve when all you have is a website that your HTML expert friend started and now has fallen behind in the trends department. 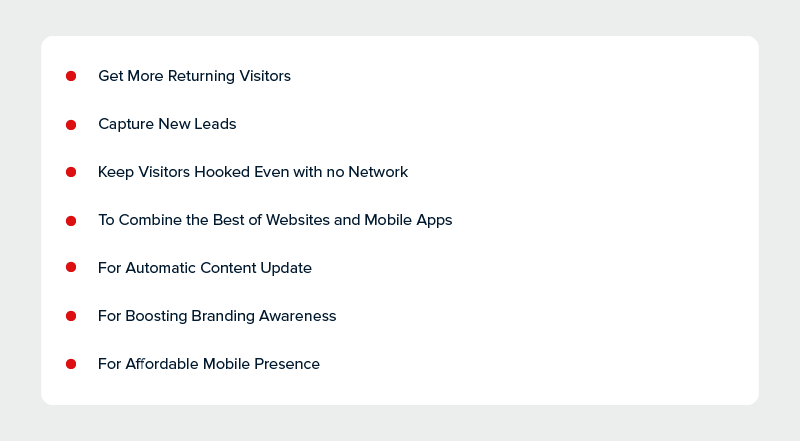 And while on one side there’s an outdated website on the other there is this conscious and costly need of the hour to go mobile if you wish to stay in the business. Posing as the solution of the founder’s dilemma is Progressive Web App Development. While we have already seen what is a Progressive Web App, it is time to see what it can do for the startups and small and medium enterprises. Getting people to remember that you exist can be one of the most difficult tasks on the planet. But the fact that the users only add your PWA after ensuring that your website has everything that they demand, brings you one step closer to become frequent. Also, the fact that PWA gets placed in the Home Screen of the devices makes it super easy for the users to be reminded of you every time they unlock their device. Business cannot run on thin air. This is something everyone knows. But, what businesses find difficult is getting their hands on the exact insights into the customer’s psyche. With PWA however, the moment user install your app you know how they will interact with the app next. Once in, you can send them info on the latest products and services with an instantaneous pop-up on the basis of the count of their visits, pages visited, and the location which they belong to. In short, unlike native apps or websites, the lead refining process which results from progressive web app development is much easier and direct, making it convenient for the sales and marketing team to direct their efforts. Unlike the Native Apps, PWAs give you the ability to be operational even in the absence of network connectivity. This way, users are able to remain hooked within the app even when the internet connection is missing and are able to experience the same native app experience under all network conditions. PWA offers the best of Websites and Mobile Apps. The technology takes what’s best in both mobile apps and websites and offer one solution to the startups to base and flourish their business on. One of the main benefits of Progressive Web Apps for businesses lies in offering real-time updated content to the end-users. By being in sync with the databases in real-time, it becomes very easy for businesses to offer real-time information update every time they launch the application. The functionality comes in very handy for businesses who rely on constant content change like restaurant or eCommerce platforms. With the Native apps from big brands taking up space on the side screens of the users, Progressive Web App Development enable SMEs to place their logo on the home screens of the million users thus helping in securing the visibility of the brand and boosting the top-of-mind awareness program for the consumers. In addition to this, PWAs also enable specific splash screen and full-screen experience with more than 78.25% long user session as compared to websites and apps, showing a picture that the SMEs can definitely expect a much higher engagement from customers when they use PWA. PWAs offer SMEs affordable alternative to a native mobile app to the end-users. With over 50% search queries coming in from mobile, Google has shifted its focus on mobile-first websites. In a scenario like this, PWAs can help startups drive greater mobile traffic by offering users facilities like less data usage, less storage spending, and much faster load time. All the benefits mentioned here are hinting towards a time where PWA is getting prepared to replace Native apps in the mobility world. Is it so? Is Progressive Web App replacing the Native Mobile apps world as we know it? Does the Onset of PWA Mean the End of Native App? While it is true that the war of Native vs PWA is seeing closeness, the latter is still years behind replacing Native Apps. The reason behind this close but still prevalent gap between Progressive Web Apps vs Native apps and why there’s a time in Progressive Web App framework becoming the default mobile application development technology can be attributed to the several limitations that the technology still comes with. Restricted Support of the Native Hardware – Although you get access to a number of native functionalities of mobile devices, you cannot use them all like in case of Native mobile apps. Limited Chances of App Stores’ promotion – While Play Store is still open to the idea of publishing PWA in the store, App Store has still not welcomed Progressive Web Apps in iOS with open arms till now. Limitations like these although seemingly minimal are prominent enough to keep PWA from becoming synonyms to the mobile application development world. So, if you ask whether PWA means the end of Native apps, the answer is no. In fact, for a startup to avail the truest prospects of being on mobile, it is necessary for them to make a presence on both Native Apps and PWAs. 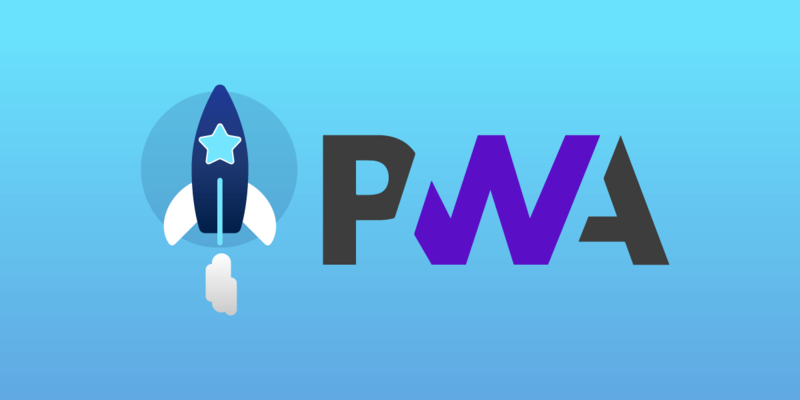 Now that we have seen the different benefits of PWA investment for mobilization of your business and the limitations which it would have to overcome to become neck-to-neck with Native apps, it is time to conclude the article with some more detailed information into When it Makes the Most Sense to Invest in PWA development like when Facebook expanded into PWA. How to Judge if PWA is Right For Your Business? When most of your users work on Chrome, Opera, and Firefox browsers. Now that you have seen it all. The next step would take you in two directions. If you have a website, migrate it into PWA and in case you are looking to make an entry straight to the mobile domain, get in touch with our PWA experts and start your progressive journey.